I made time this weekend to tidy up my space and it was well worth it. I stumbled across the Candy Time!!! stamp by Penny Black. I have had this stamp for quite a while but I have never used it. I wasn’t really sure how I was going to tackle this stamp so decided to stay pretty close to the colours on the decal. Made it much easier to colour it the first time. 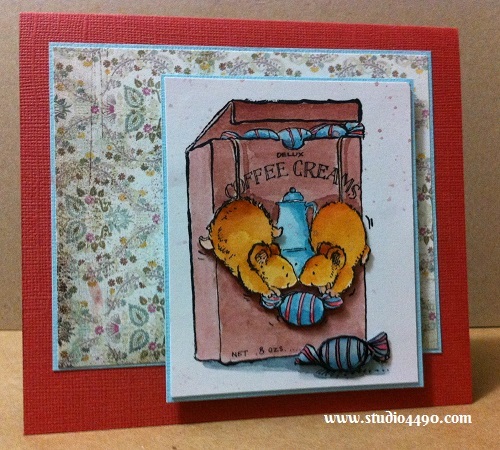 Materials used: Stamp – Candy Time!! 1679K (Penny Black); Cardstock – American Crafts, Knight; Designer Paper – Soleil 6×6 Paper Pad (Basic Grey); Distress Markers; Ribbon (Unknown) and Glossy Accents (Ranger). I decided I wanted to try a different colour combination. It doesn’t have quite as much oomph as the original but I still like it. The colours also co-ordinate much better in real life! Materials used: Stamp – Candy Time!! 1679K (Penny Black); Cardstock – American Crafts, Bazzill Basics Paper, Knight; Designer Paper – Plumeria 6×6 Paper Pad (Basic Grey); Distress Markers; and Glossy Accents (Ranger). 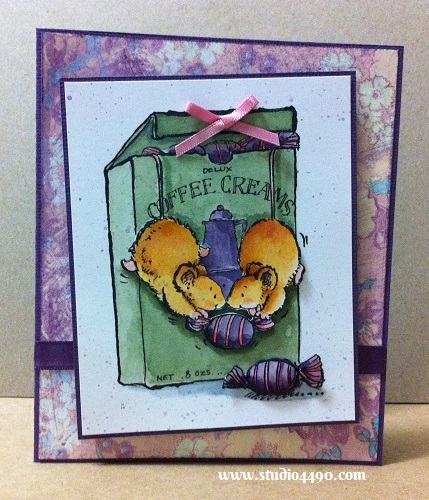 On both cards, I popped up the two mice and also one of the lollies just to give it a little more dimension. I added glossy accents to the lolly on the bottom right but I am thinking of going back to add glossy accents to all the others. And voila two cards done. I haven’t added a sentiment. Wasn’t really sure what I wanted to use the cards for at this stage. Can always leave it blank, or add it later. Update: I decided to go back and add glossy accents to all of the lollies – finishes the cards off perfectly! Hope you are all having a wonderful day no matter where you are in the world! So darn adorable! I like both color combinations! Kylie, these wee mice sneaking away with the candies are just toooo sweet! Both cards are fabulous, so it’s impossible to decide which I like best. The colouring on both is, as always, stupendously awesome, and your background papers pair perfectly! Darling+++ Have you seen the challenge at Freshly Made Sketches? I think your cards would be a wonderful fit!! Check it out…and I hope you go for it!! I’m wrapping up a couple cards for the PS challenge, and hopefully will have a chance to make a start on a couple more! Hope your day is fabulous! Oh yes, if you have Christmas stamps (d-uhh, of course you do!!) check out the Merry Monday challenges at alwaysplayingwith paper, as well as Festive Friday. Your colouring skills would turn heads there for sure! !